On the 21st of February, Stephen will be giving a talk at the Wigtownshire Antiquarian & Natural History Society on William Symington. 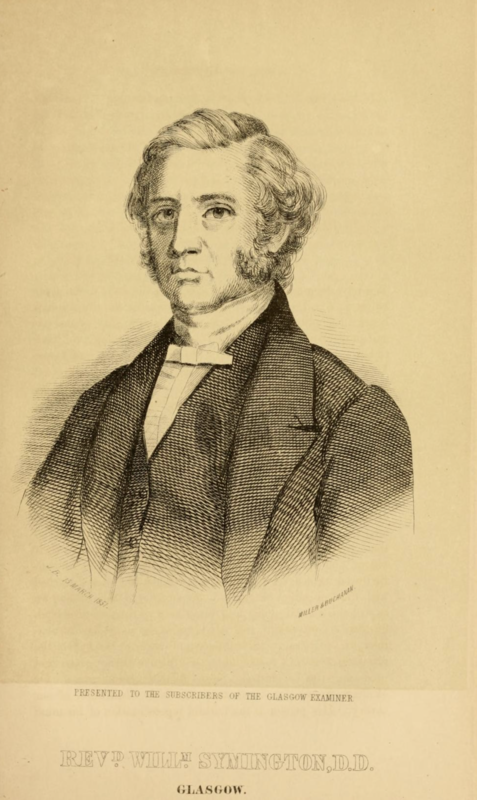 2019 marks 200 years since Symington’s ordination in Stranraer and he remains Stranraer’s most famous minister. 2019 will be the 200th anniversary of the Reverend William Symington’s ordination in Stranraer where he commanded significant influence on the south west of Scotland and the wider ecclesiastical scene. A noted evangelical in the covenanting tradition, Symington was none the less outward-looking and deeply involved in social issues such as slavery, illiteracy, and poor working conditions. As the current Reformed Presbyterian minister in Stranraer, and with an MA in history, the Reverend Stephen Steele will present the findings of his research into one of Scotland’s most powerful and eloquent preachers. As part of his research for the talk, Stephen has been reading some contemporary accounts of Symington. One, in a book entitled Our Scottish Clergy, includes a description of the morning and afternoon worship services in the Great Hamilton Reformed Presbyterian Church in Glasgow in 1847, eight years after Symington moved there from Stranraer. Last Sabbath, at seven minutes past eleven, he entered his pulpit, and at a quarter-past eleven, the greater part of his large congregation had assembled. Some, however, continued to enter till the half hour. The services were commenced by singing the last four verses of the 31st psalm; and, after prayer, Psalm Ixxi. 10th to 15th verses inclusive, were read and expounded at considerable length (twenty minutes), and then sung. The only thing remarkable in this part of the public services of the body (the Reformed Presbyterian) to which Dr Symington belongs, is their exclusive use of the psalms — paraphrases and hymns being both prohibited. Two minutes before twelve, the 11th and 12th verses of the sixth chapter to the Hebrews were read as the subject of lecture. The lecturer first showed that these verses might be connected with the warning against apostacy in the beginning of the chapter, or with the verses immediately preceding them, in which the apostle had expressed his full confidence in those he addressed. He then proceeded to minutely analyse the subject of lecture, and to give the strict meaning of some of its original terms. He remarked that the word rendered desire in the eleventh verse, means vehement or intense desire, and indicates the deep anxiety a minister feels for his people. He also pointed out the minuteness of ministerial care indicated by the terms "every one" In speaking of Christian assurance, he said that Paul mentions it in three places, and in each of the three its aspect is peculiar. In Col. ii. 2, it is the assurance of understanding; in Heb. x. 22, it is the assurance of faith ; and in the passage under consideration, it is the assurance of hope. The former two passages, he said, referred to objective assurance, the latter to subjective assurance — a perception and conviction of truth revealed, and a personal interest in truth received — the former being the assurance of faith, the latter of sense. He then stated the character of this assurance ; that it was no vague idea of safety, nor even of the mere acting of faith, but a deep personal persuasion of an interest in Christ, founded on satisfactory evidence. That such assurance is attainable he proved from the facts, that it is the subject of apostolic benediction, exhortation, promise, and example. He stated that it was attainable by perseverance and practical godliness, and that all believers had it not, and that no believer had it always. He deprecated the conduct of those who consider doubts and fears essential to safety; these he affirmed were neither parts nor evidences of a man's Christianity. He then stated the three things that the apostle desired of the Hebrews — to show diligence, to avoid sloth, and to imitate those inheriting the promises, who, he said, might be either the living Gentiles, or their departed brethren, the Jews. He concluded by showing that sloth was sufficient to secure irretrievable ruin, and that the example of the saints is designed for imitation. He finished his excellent lecture at five minutes to one o'clock, and concluded the services by prayer, singing, and the benediction which was pronounced shortly after one o'clock. In the afternoon the people had assembled by a quarter after two. The church was well filled, almost every pew being fully occupied. After singing, a prayer of much fervour and very great length was offered. A chapter was then read without remark, and the second singing being over, Rom. xiii. 14, "But put ye on the Lord Jesus Christ," was announced as the text. He commenced by stating that the text is a counteractive of the evil stated before it. He then divided his subject into two parts. First, he would open up what was meant by putting on Christ ; and, second, he would offer some remarks suggested by the text. On his first head, he remarked that the phrase "put on" is figurative, and is used in reference to God, who is said to put on vengeance, zeal, &c., and also to man — Job says, "I put on righteousness." More particularly he observed, first, that putting on Christ means to make a profession of religion. As many as are baptized, in a certain sense, put on Christ ; but in a higher sense, those who voluntarily and intelligently attend the other rite — the Lord's Supper — comply with the injunction in the text. To put on Christ includes, secondly, believing in him for justification. Thirdly, it means being conformed to the image of Christ, or the possession of a new moral nature. He quoted Ephes. iv. 24, and Col. iii. 10. Fourthly, it includes imitating Christ's example, which he considered the chief idea of the text. Finally, it supposes an appropriating of Christ wholly. He then proceeded to make his general remarks suggested by the text. First, what clothing is to the body, Christ is to the soul — a covering, a comfort, a protection. Second, in putting on Christ, we must put off whatever is opposed to him. Third, Christ ought to be seen in his people — the command is to put on Christ, and what we put on is visible. Fourth, Christ is to be so put on as never to be put off. Fashion or decay induces a change of raiment, but neither affects the putting on in question. He then concluded by censuring those who think it enough that God sees and knows their religion — man must also see and know it. He briefly described the happiness of those who have put on Christ, who are clothed in the fine linen clean and white — the righteousness of saints. The discourse commenced at a quarter to three, and was finished at twenty minutes to four. The concluding services were similar to those in the forenoon, and the congregation was dismissed at ten minutes to four. Undoubtedly, the most well-known minister the RP Church in Stranraer has ever had was William Symington. He was minister here for twenty years, from 1819-39. Shortly after he came the church building was rebuilt to hold 700, and was regularly packed out. He's most well-known for two books which he wrote while minister in Stranraer, which are still in print today. We recently were reminded of him twice in a week. Firstly, in our study on the Shorter Catechism, we reached Q25 which is about how Jesus is our great high priest. That was the subject of Symington's first book, On the Atonement and Intercession of Jesus Christ. Then, in our sermon series on Daniel, we reached the end of Daniel chapter 9, which is where the title of Symington's most famous book, Messiah the Prince, comes from. Symington, William (1795-1862), RP theologian. He was born in Paisley and ordained in the RPC in Stranraer in South West Scotland, serving as pastor there 1819-39 and then in Great Hamilton Street Church, Glasgow, 1839-62. He published two theological works, On the Atonement and Intercession of Jesus Christ (Edinburgh, 1834) and Messiah the Prince (Edinburgh, 1839). 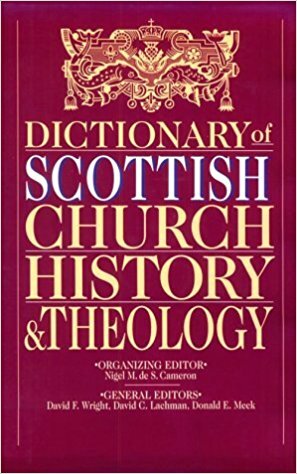 The latter was his most important contribution to Scottish theology; it expounds a basis in the theology of Christ's kingship and kingdom for Church-state relationships. The RP Synod elected him Professor of their Theological Hall after the death of his brother, Andrew Symington in 1853, and once described the two brothers as 'the most distinguished ministers who have been raised up to us since the martyrdom of James Renwick. They led the RPC out of an attitude of narrow provincialism focused on self-preservation and into a sense of missionary responsibility for the Church in Scotland and throughout the world. Symington was pre-eminently a Covenanter Evangelical. He once described how, at the age of seventeen, 'I gave myself away to the Lord in a solemn, personal covenant.' He insisted that the only basis for Scotland's national covenants was the covenant of grace. He became deeply involved in social reform because he saw intemperance, ignorance of the Scriptures, illiteracy, slavery, bad working conditions and corruption in government as moral sins in a nation committed to God in public covenant. He was recognized as one of Scotland's most powerful and eloquent preachers and frequently spoke to these issues in other churches and on public platforms. What Thomas Chalmers and Andrew Thomason were to Glasgow and Edinburgh, Symington was to south-west Scotland. In Glasgow he focused on the thousands drawn into deplorable living conditions by the Industrial Revolution. The church (which seated a thousand people) went to three services, then formed two mission churches and a school system involving over 900 students and fifty teachers. In 1838 the University of Edinburgh recognised his leadership by granting him the degree of DD. His life motto was (in Greek) 'To God Alone be Glory'. 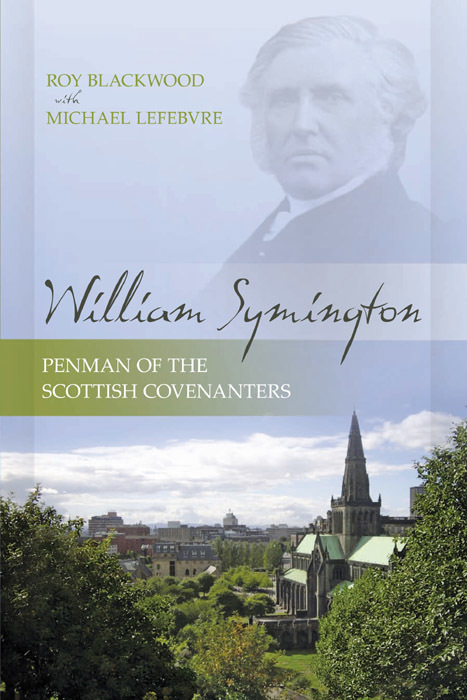 In 2009, an account of his life, as well as summaries of his books, by Roy Blackwood and Michael Lefebvre, was published by Reformation Heritage Books entitled: William Symington: Penman of the Scottish Covenanters. The original account of Symington's life was written by his sons and included in the second edition of Messiah the Prince. It is now available on our website. These last two resources make use of Symington's unpublished journal.